I remember my first time stepping foot into Jada Blitz Training a few years ago and immediately falling in love with the energy and intensity running through the gym. 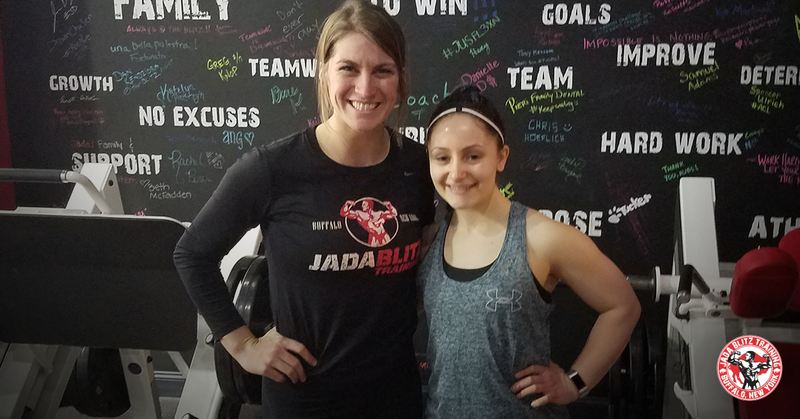 From the trainers pushing their clients to give it their all, to the equipment variety and the turf (my favorite part); I knew right away that I wanted to become a part of the Jada Blitz adrenaline. A huge personal accomplishment of mine is so far being able to max on the bench at 135lbs and at 185lbs on my squat. Those numbers are not something that I would ever even think could be possible without Danielle standing behind me every step of the way and building up my strength each week to get to these points. I’m so proud to be a part of the Jada Blitz Training family and can’t imagine training anywhere else! And huge shout out to my personal trainer Dee for always being so upbeat and fun to be around at 5:30/6am!